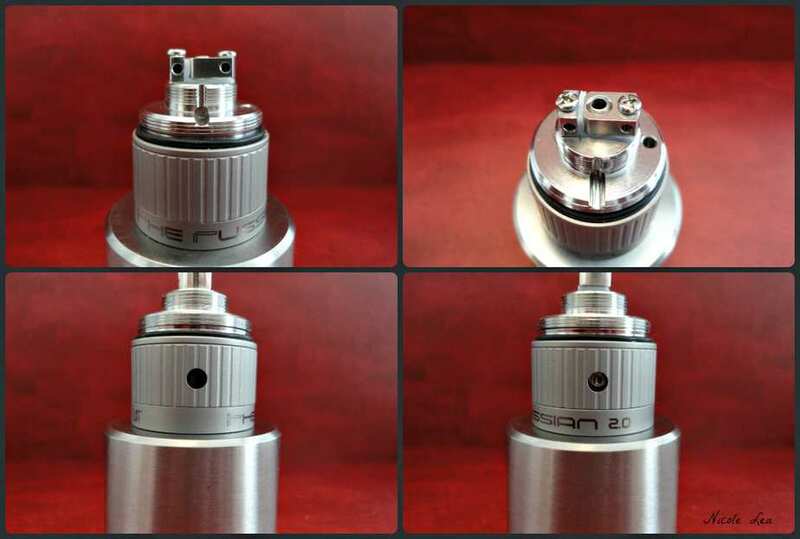 The Russian 2.0 is a bottom coil rebuildable tank atomizer designed and branded by Upper Class Technology, and manufactured and distributed by Shenzhen Kebo Technology. 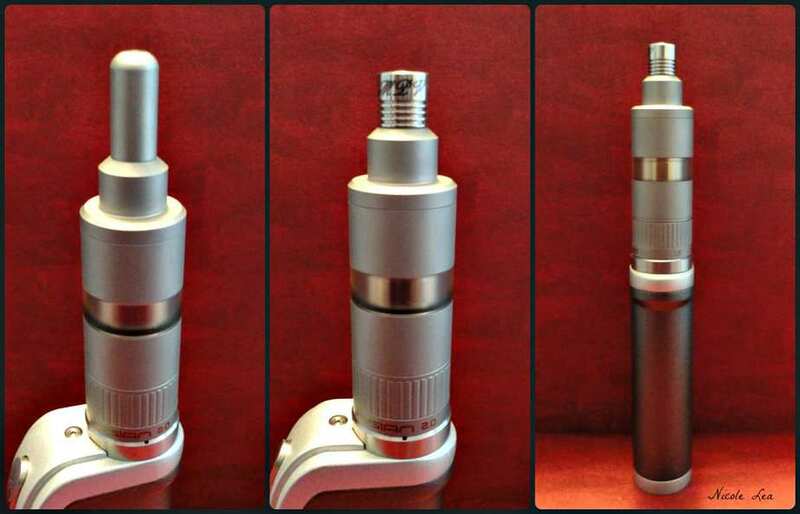 The Russian 2.0 is the upgrade to the original Russian full size atomizer (not the 91%). While the original Russian is considered a copy of the original Kayfun v3.1 made by Svoemesto, ironically the original Russian and the Russian 91% are still largely regarded as “authentic” high end atomizers as well. I think this is due in part to the conflicting stories regarding the origins of this atomizer, but also the undeniable build quality of the Russians. It is believed by some that the original Russian atomizer was created by a former design partner of Svoemesto, who then created the Russian following a fall out with one of the creative members of Svoemesto. This is a story/rumor which I have heard both affirmed, and denied within the vape community. Whether true or false the Russian series of rebuildable tank atomizers has gained a reputation for being a high quality atomizer that is as good, if not better than the Svoemesto branded Kayfun series of atomizers. 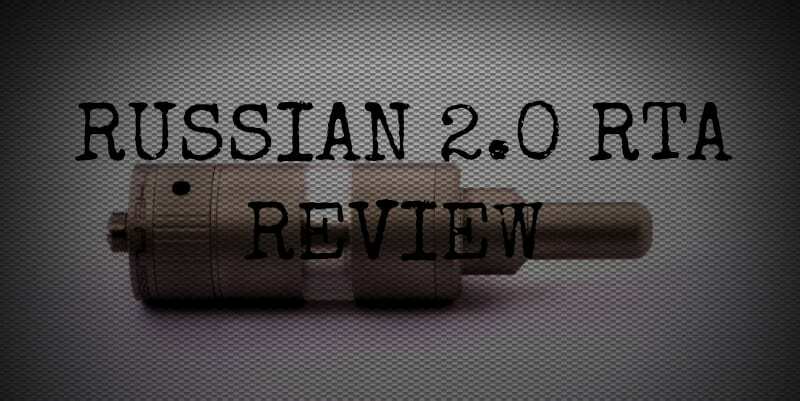 The Russian 2.0 RBA featured in this review comes in a branded gift box which includes the atomizer, a 10ml syringe tip e-liquid bottle, a spare parts package, and a blow- out assembly guide. The Russian 2.0 retails for $114.99-120.00USD at various online retailers. The newer Russian 2.0 RTA brings with it a few functional upgrades, even as the changes to the aesthetic of the atomizer are minimal, which I like. The Russian 2.0 is constructed from 316 grade stainless steel, and is available in a Matte finish (featured in this review), or a mirror Polished finish which I am not really fan of for this style of atomizer. The Kayfun v3.1 is one of my favorite atomizer styles aesthetically speaking, so I was happy that UCT did not take the same direction of the new Kayfun V4 and completely revamp the look . The matte/sandblasted finish is superb in my opinion, and is one of the nicest matte finishes that I have seen on an atomizer. This says a lot coming from me because I am not usually a fan of sandblasted finishes, but I am a fan of this one. The name Russian 2.0 is printed across the bottom of the atomizer like the original Russian. The most apparent upgrades to the body of the atomizer is the newly added AFC ring which has a vertical line pattern that also makes gripping and moving the AFC ring easier. 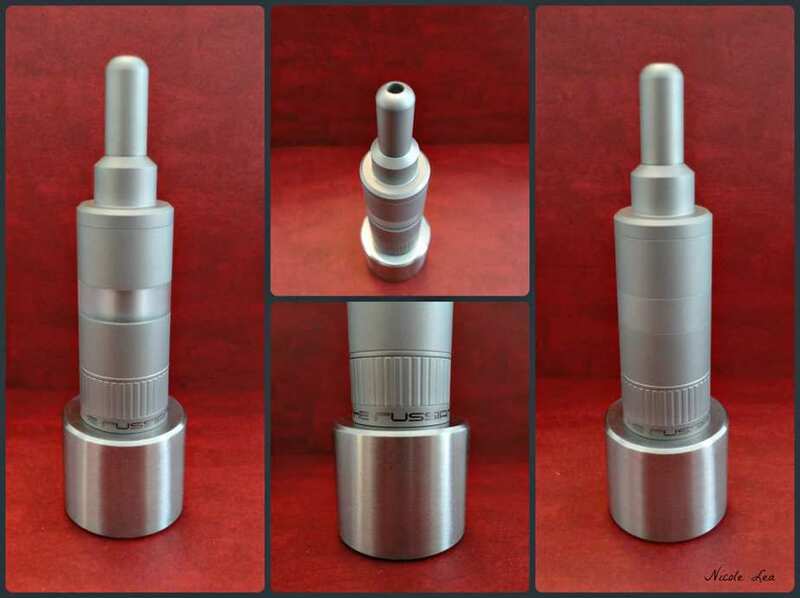 A removable drip tip has been added to the full size Russian design, and the drip tip itself now features a wider bore. The Russian 2.0 comes standard with a matching stainless steel tank section and a polycarbonate tank section. To better illustrate the differences between the older Russian design and the new, I have photographed it next to the Kayfun v3.1, of which the original Russian was a copy. The new Russian 2.0 is about 2mm taller than the older style, and this may be a negative for some however, it does not bother me. I have always preferred the longer body of the v3.1 over the Kayfun Lite body which is a little frumpy in my opinion. 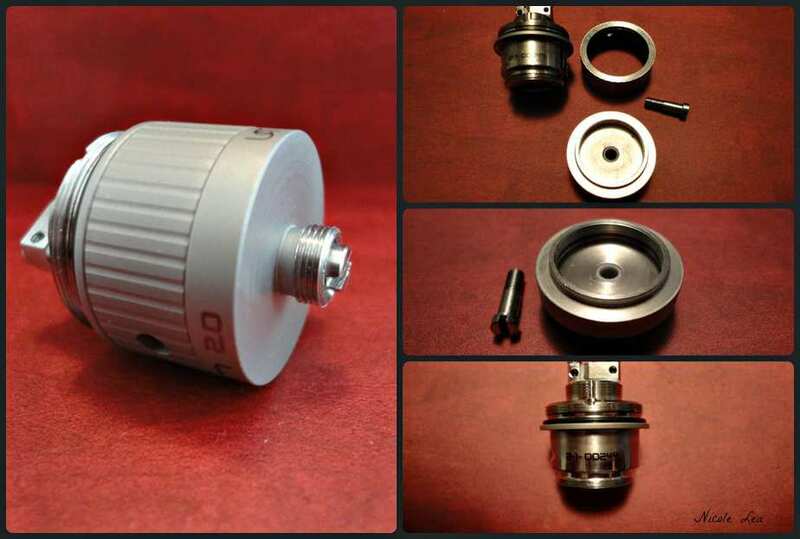 The Russian has a removable 510 drip tip in place of the old threaded drip tip. . The neck of the 510 drip tip hole is slightly wider, and you can also see that the bore in the drip tip is also wider than the older version. The new Russian features a 3mm air hole which can be partially closed off, or left fully open. The AFC ring has a nice feel to it and it is neither stiff nor loose, and it does have a click stop to keep it from spinning freely. The fill port of the Russian is now hidden behind the AFC ring, which creates a cleaner look on the outside of the atomizer. 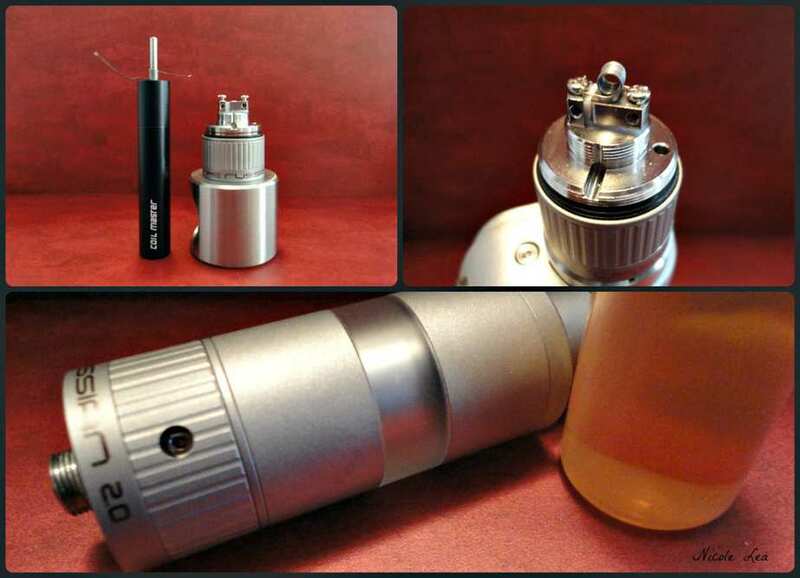 The Russian 2.0 breaks down into the same 10 basic parts as the original Russian atomizer. 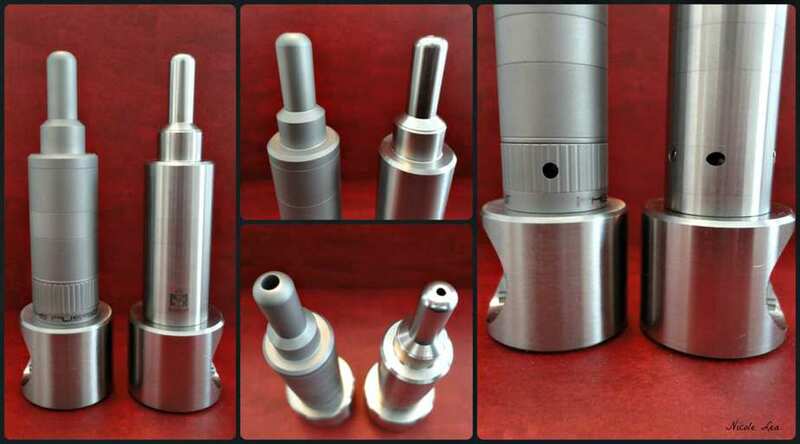 The machining on all parts of the Russian 2.0 is exactly what I would expect from any higher end atomizer, which is very clean and precise. The Russian 2.0 also comes with a generous spare parts package which includes two mini screwdrivers (phillips and flat head), spare o rings for all parts, extra screws, and silica wick and wire. There is a parts assembly blow out sheet, and also a user warning to first remove the 510 contact screw before attempting to remove the lower half of the base. If you have seen Phil Busardo’s review of the Russian 2.0 then you will understand why that warning is now included in the packaging. But I will also elaborate on this a little later in the review. The build deck of the Russian is basically the same as the prior version of the Russian however, there are a few improvements. The insulator under the positive block now runs from the bottom of the positive block and in between the positive and negative blocks. The purpose of this is to prevent a hard short in your device if the positive blocks shifts while in use. This has actually happened to me with the older Kayfun v3.1, and while I was using it with a mech so I very much appreciate this upgrade. There are also two holes drilled through both the positive and negative blocks, although I have no idea why. The juice channels are still wide and deep, something that had always been considered an advantage of the Russian over the Kayfun. The AFC ring is used not only to control air flow into the Russian, but to also cover or expose and access the e-liquid fill port. The Russian 2.0 now features an adjustable 510, which had already been seen on the Russian 91% which is the Kayfun Lite equivalent of the Russian atomizer. The base of the Russian 2.0 further breaks down into 4 parts, the build deck, AFC ring, bottom plate and the 510 pin. As the user warning indicates, you must first unscrew and remove the 510 screw BEFORE you unscrew and remove the female threaded bottom plate, otherwise you run the risk of snapping/breaking your positive post screw which holds that portion of the atomizer in place. You will also notice that base beneath the AFC ring is also serialized. Being that the basic design of the build deck remains unchanged, building the Russian 2.0 is the same as building any other Kayfun style atomizer. I used my coil master with the 2.5mm rod, and 27 gauge Kanthal wire to make a 9/10wrap micro coil which metered out to 1.45 ohms. I didn’t have any problems with catching this thicker gauge wire with the included deck screws. What is a little new to me is using the side fill port to fill the tank with e-liquid as I have always used the top fill method with the older Kayfun v3.1. I am not certain of the exact gauge/size of the syringe tip on the included fill bottle, but I do know that any needle tip that you would use to fill the Russian 2.0 should not be larger than it. While the fill port works well, filling is much slower when you are using a max VG e-liquid, which common sense says is to be expected. 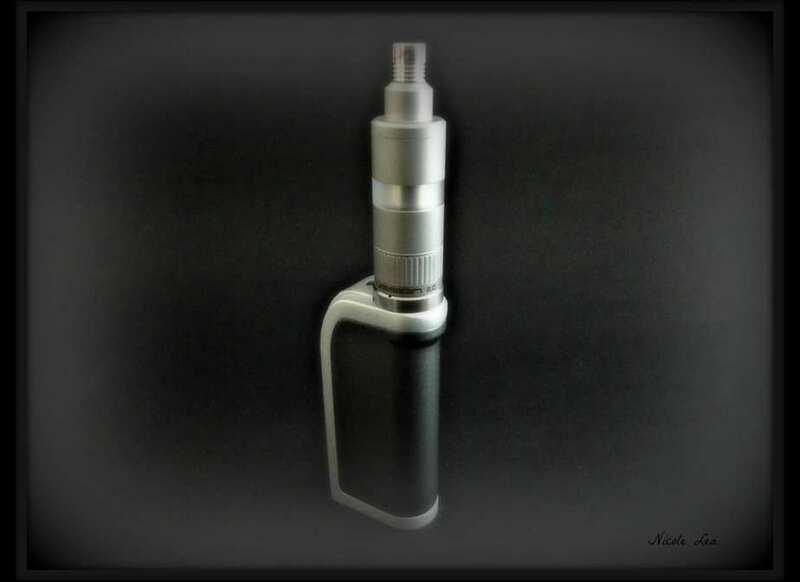 Since I do use max VG liquids 80% of the time, I now prefer to use the top fill method which does work for me. To top fill the Russian 2.0 I cover the outer air hole with my finger, then I fill the tank to the point below the last thread inside the tank, which will prevent excessive flooding and leaking when the top cap is reinstalled. With my finger still covering the outer hole on the AFC ring, I catch a “single” thread of the tank with the top cap and then immediately turn the tank upside down, remove my finger from the air hole and continue to screw on the top cap. When done in this way I do not experience any excessive flooding or leaking of from my atomizer. On occasion if I am not mindful to turn the tank over after catching a single thread with the top cap, some e-liquid will get pushed into the chamber. But this is usually only enough to create a slight gurgle, which again is not excessive. When this happens I simply turn the atomizer upside down and blow out any excess e-liquid and then get to vaping without further issue. Just as it was with top filling the older Kayfun, there is a “technique” for successful top filling, which some have mastered, and some others not so much. Now let’s talk about the vape quality .. The vape quality of the Russian 2.0 is excellent in my opinion. From the first draw I feel that the flavor produced is spot on, and with the 3mm air hole at max open the vapor production is plentiful. Based on the quality of vape, the Russian has become one of my favorite atomizers right alongside the Aqua V2 by Footoon. While I have found my way with the Tobeco Kayfun 4, and do enjoy it a lot, the Russian 2.0 is the winner of the “new and improved” battle in my book. I have read a lot of criticism of the new Russian 2.0 for not taking its upgrades far enough, while I have also read even more criticism of the new Svoemesto Kayfun V4 for being overly engineered and complicating its upgraded air flow control and top filling method. So it is fair to say “damned if you do and damned if you don’t with regard to both the new Russian 2.0 and Kayfun V4. While I cannot objectively say that the Russian 2.0 is better than the Kayfun V4, I will say that I do like the Russian 2.0 a little better in terms of aesthetics, functional upgrades, and overall vape quality. Now, all was not exactly smooth sailing for me though. I did in fact have occasion to accidentally partially unscrew the base from the base plate while the Russian was still attached to a regulated device (SXmini). But I caught it, and tightened everything back up while the Russian was still attached to my APV and continued to vape. However, about 4 days later the resistance on my SXmini with Russian 2.0 attached started jumping all over the place, and as high as 4.32 ohms — oh no *insert a single tear drop*. As it turned out, the positive screw did manage to slowly work its way out of the positive block, which then caused the positive block to shift and the resistance to drastically fluctuate. However, my device did not short out because of the upgraded insulator between the positive and negative block. Initially I thought that I had a Phil Busardo situation on my hands, and that my new love was now toast. Thankfully that was not case as my positive screw did not snap and break as Phil’s had done. All I needed to do was tighten up the loose positive screw, rebuild my coils and I was back in business. I must also mention that this incident only occurred once during the 2 months that I have had this atomizer. While the Russian 2.0 does look better with other more stylish drip tips, I find myself using the standard drip tip most often because of how it enhances the vape quality. The draw on the Russian 2.0 is so wonderfully smooth to me, and it is this that edges out the Kayfun V4 for me. The flavor, air flow, and smooth draw is just lovely to me. One of the things that I appreciate the most about the Russian 2.0 is that UCT did not go the route of drastic change in order to improve upon the atomizer, and I do feel that it is improved. I remain of fan of the older body style of the Russian/Kayfun and I feel that the aesthetic still holds up. Although it would have been nice to see a more “fool proof” top fill method integrated into the upgrades of this atomizer. However, all in all I still prefer the vape and functionality of the Russian 2.0 over the Kayfun V4. While I use the Kayfun V4 a lot, I use the Russian 2.0 every day. That being said, there are still aspects of the Russian 2.0 that may not be right for every user. So I am certainly not telling everyone that they should run out and get one. Just as it with every other device that I have reviewed, it is up to the viewer to weigh the pros and cons in order to determine if this is an atomizer that is right for you. I love the Russian 2.0, but that doesn’t mean that you will too. While the Russian 2.0 is a top quality atomizer that is not as expensive, or as hard to get as the Svoemesto Kayfun V4, it is also not cheap at $114.99. There is a Russian 2.0 clone on the market, although I have no experience with it. But it is an option if you would like a cheaper trial of this atomizer. Nicole, I know you said it was smoother, but would you say the airflow at max is more airy or more restrictive than the stock K4, or about the same? I love the quality, features and aesthetics of both devices, but I just can’t stand the restrictive draws these things favor. I sold my genuine KFL at a loss, hated the draw that much. And then went and bought a pack of Camels with the proceeds. Wasn’t until I hit an Atlantis that I found a tank vaping style that kept me off analogs. Sadly, nobody is making a “classy” RTA with comparable airflow. The Lemo, Goblin, and Silverplays work (as do the Subtank Mini and Delta II with RBA installed), and they’re cheap enough, but certainly not premium. It’s an under-served market. Somebody needs to step up. Hi Croak .. the Russian is far from restrictive dear, no one could call the air flow restrictive on this. IMO the max air flow is more open, and smoother than the Kayfun V4, not to mention much easier to change and adjust. In terms of air flow and adjustments the Russian wins easy. The Russian’s air flow is nothing like the restrictive KFL, of which I own several. Not sure if this applies to the Russian 2.0 clones, but I can tell you that I would never buy an authentic Kayfun V4 most especially after buying an authentic Russian 2.0. Yet another great review. I agree about the finish on the Russian. I have 4 91%, 3 in the Matte and one in the Mirror finish. The Matte finish looks fantastic and has not diminished through out all the useage. The Mirror finish looks great but the only problem I have with it is it’s really a pain trying to unscrew it. Your hand keeps sliding because it’s slippery, and if you are trying to get the whole tank off you end up breaking it down piece by piece. At least that has been my experience with it. But I deal with it because of the great vape I get from it. I haven’t tried the full size Russian yet but because I enjoy the 91% so much. The quality of these atty’s are great so I can see why you like it and I might just pick up one Thanks again for the review! After 40+ years of smoking I have recently moved in to vaping. Trying to educate myself I have been reading here and there whatever considered interesting to me. Few times so far I was somehow redirected to this site and reading few of yours review. Accordingly I have come to conclusion that there is no good and real vaping without using rebuildables. I am generally delighted with quality stuff and workmanship that these little things definitely are but at this moment I don’t want to play with coils, cotton… I have bought few MODs even few mech just to experiment. To foreshorten what would you recommend as best pre-built clearomizer and corresponding mod? Can you also advise where to get genuine gear since I am a bit fed up with all made in China fake crap. Any advice from expert will be highly appreciated. Thanks Nicole for prompt reply. I’ll give a try.